If an author "name" includes an author and translator, please combine it with the author, not the translator. Thus "Dante, translated by Ciardi" should be combined with Dante Alighieri, not with John Ciardi. And, of course, it's better still to list them separately as author and translator, instead of together as if they were a single entity. John Ciardi wrote a science fiction story, The Hypnoglyph, as James Anthony. It appeared in an anthology named Science Fiction Stories. 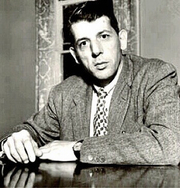 John Ciardi is currently considered a "single author." If one or more works are by a distinct, homonymous authors, go ahead and split the author. John Ciardi is composed of 9 names. You can examine and separate out names.